For the past two hundred years, Western readers, young and old alike, have been transported to the fabulous Orient by means of these remarkable stories, in which the everyday mingles on an equal footing with the uncanny and the miraculous. Accompanying the text are illustrations by W. Heath Robinson, which are themselves miracles of visual and imaginative sympathy. William Heath Robinson (1872-1944) was the youngest of the three artist sons of a wood engraver. Born in Hornsey Rise, north London, he studied at Islington School of Art and briefly at the Royal Academy Schools. His grandfather, Thomas Robinson, had been a bookbinder working in Newcastle for the famous wood engraver, Thomas Bewick, and subsequently took up engraving and illustrating himself. It is not surprising, therefore, that all three brothers – Thomas, Charles and William – became book and magazine illustrators. 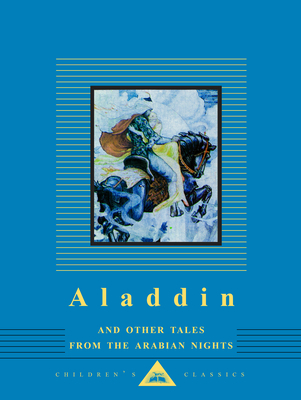 William was still in his twenties when he was commissioned, with other young artists – Helen Stratton, A.D. McCormick, A. L. Davis and A. E. Norbury – to illustrate a collection of stories from The Arabian Nights, published in 1899. William's contribution was by far the largest and the best, demonstrating the beauty of line and composition that characterized his illustrations for other literary classics. But now he is chiefly remembered for his humorous drawings and the weird contraptions that gave his name to the English language for any mechanical device 'absurdly complicated in design and having a simple function'. At the Memorial Exhibition after his death, one of his few peers in comic drawing, Nicolas Bentley, compared him to Leonardo da Vinci, claiming that Heath Robinson 'had the advantage of Leonardo, in that some of his inventions did at least look as if they might have worked'.